So when FEMA or other federal funds are expended in clean-up of the Gulf, will the Tea Party crowd protest the bailout of BP? Addendum: Quote of the week. The magical wonder of off-shore oil drilling. 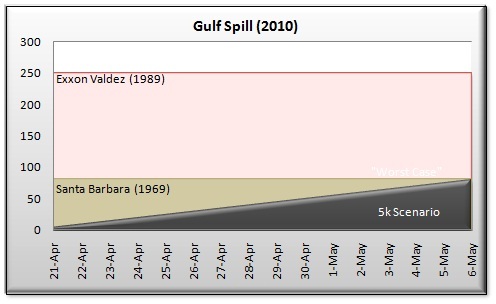 Addendum: According to this chart posted on Daily Kos, the “spill” is nearly at the levels of the 1969 Santa Barbara incident based upon the 5000 gallon estimate. But this isn’t a “spill.” It’s a continuous gusher. I just haven’t had the time to sit down and do one myself, but Heraldo did a very good job summing it up. As Heraldo notes, it was the most contentious of the debates so far, at least between Jackson and Gallegos. More debates to come up, including a discussion format next Thursday on KHUM which will take a format very distinct from the debates so far in encouraging direct interaction between the candidates. I’ll post more information soon. Citizens Against Legalizing Marijuana (or CALM). They have a brochure. Thanks to Calitics for the links. They stacked the BOS meeting yesterday and demanded more than the 1/2 hour which they were going to be given. They were given much more time. KMUD has the story tonight. Heraldo has it as well. I was just on the street where someone informed me that I should listen to KMUD tonight for big news. I don’t want to repeat rumors here, because I have no way of separating them from the truth from what I’ve heard. Just suggesting you tune it at 6:00 p.m.
Downey or Hislop? I haven’t put in any attention to this race. Usually you can’t take out an incumbent unless you have an issue to run on. So what is the issue? What’s the race about exactly? Addendum: Humboldt Mirror endorses Downey. Kathleen Bryson has dropped out of the D.A. race. I’ll miss her enthusiasm. She did spend time in Southern Humboldt, and some here were very appreciative of her marijuana enforcement positions. I’m still predicting a runoff after June. Maybe it’s time for another straw poll. Addendum: I don’t know whether her name will remain on the ballot. Anybody know? Second addendum: Here’s Bryson’s statement. After much thought and discussion with my family, I have made the decision to drop out of the campaign for Humboldt County District Attorney. While I am grateful for the opportunity, the campaign was taking too much time away from my family and legal practice. I am only 44 years old, the youngest of the da candidates, and our children are school-age. In particular, our youngest daughter is in elementary school, and my many hours away from home were taking too much of a toll on her. In addition, recently, our eldest daughter suffered a very serious car accident that has put matters into perspective for our entire family. I want to thank all the people who contributed their time, money and moral support to my campaign. I also want to thank the other candidates for their open dialogue in relation to the issues. The experience of running for public office has given me profound respect for those who sacrifice their time and privacy to be our public officials. Classic. I haven’t seen this in years, since it was replayed during the “Yippie vs. Yuppy” debate tour between Rubin and Abbie Hoffman after Rubin had determined that “power is in money, not people” just a few years after this interview. My favorite part is when, following a diatribe about Donahue’s commercialism, Rubin tries to push his book – like any Donahue guest. And here’s post-underground Abbie Hoffman coming to Rubin’s defense, somewhat. Both were clearly over 30 by then.